The progression of 4K HDR 8×8 Matrix Switchers continues to push manufacturers to develop solutions to keep up with the technology. It’s clear that HDR is the core of televisions future. At BZB Express, we are lucky to have partners who drive innovation when designing and developing 4K HDR 8×8 Matrix Switchers. Once again, we’ve stacked three of the most cutting-edge 4K HDR 8×8 matrix switchers to observe their performance. We say, once again because we created a video earlier this year, in regards to 4K UHD 4×4 HDMI matrix switchers. By the way, here’s the link to that video! The three units we are reviewing are the Key Digital KD-Pro8x8D, Atlona AT-OPUS-810, and the AVPro Edge AC-MX88-AUHD-HDBT. They are all enclosed in an 8×8 chassis that can fit in a 2U rack. AVPro Edge sports a smaller design that can fit in a 1.5U rack. We’ll investigate their output resolutions, audio support, control options, pricing, warranty, and switching performance. By the way, if you don’t feel like reading, the guys at BZBtv flexed their prowess and created a video to review the units, below. Let’s kick it off with the resolution! First of all, the three 4K HDR 8×8 matrix switchers are HDCP 2.2 compliant. What this means is they all adhere to the copyright standard to prevent illegal copying of 4K Ultra HD content. Devices that support HDCP 2.2 are more likely to be compatible with current and future 4K content. All three units are up to date with the latest HDMI technologies. The AVPro Edge and Atlona boxes separate themselves by supporting 4K at 60Hz with 4:4:4 chroma subsampling with Full HDR transmission at 18Gbps. Key Digital can support HDR also, but at a lower color depth and frame rate at 10.2Gbps data transmission. Each unit approves audio formats such as Dolby Digital Plus, Dolby True HD, DTS-HD Master Audio, and Dolby Atmos. All the devices allow extraction of audio from the selected HDMI input. Furthermore, the KD-Pro8x8D grants the coax digital (PCM) and analog L/R balanced/unbalanced output for de-embedding audio. Also, a built-in audio DSP lets the user control volume, balance, muting, and lip-sync delay per output. The Atlona AT-OPUS-810M and AVPro Edge AC-MX88-AUHD-HDBT offer an independent audio matrix switcher for routing de-embedded audio from the HDMI input. Moreover, AVPro Edge’s matrix will let you extract audio with three operating modes; bound to input, bound to output, or independent matrixing. Each unit supports ARC or Audio Return Channel, enabling audio to be returned from the display to a respective audio output. Users can also isolate the audio from the 4K HDR 8×8 matrix switchers to a surround sound system or amplifier. Also, each unit is equipped with an audio delay for digital and analog outputs to assist with lip sync for video. All three 4K HDR 8×8 matrix switchers use a proprietary HDBaseT technology to route HDMI signals including RS232, IR, Ethernet, and power to be used to control their equipment on both ends. HDBaseT technology supports different forms of media and controls over long distances. Traveling the long distance via CAT cable will require a receiver on the display end to convert the signal back to HDMI. It’s also convenient that HDBaseT technology can power up the receivers on the other end without a separate power supply. 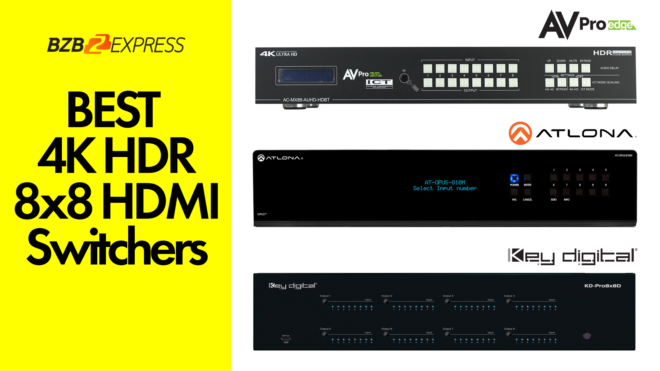 The KD-Pro8x8D 4K HDR 8×8 matrix switcher includes a total of 8 receivers out of the box; (6) Standard Range KD-X88SHRx, (2) Long Range KD-X88LGRx. Unlike the receivers for Atlona and AVPro Edge, they are sold separately. The compatible receiver for Atlona is the AT-OPUS-RX, and for AVPro Edge, it’s the AC-EX70-444-RNE. All three matrix switchers have their own control systems, including their own web GUI that can be accessed online. In addition, Key Digital offers Compass Control, which is compatible with iOS and Android device controllers. Atlona has Velocity IP-based control and management. These 4K HDR 8×8 matrix switchers all have driver support for all major control systems. 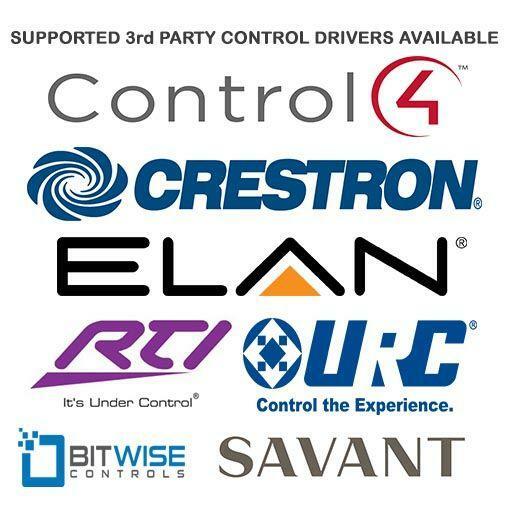 Players including Crestron, Control4, RTI, and ELAN to name a few, are compatible. Also, each unit is controllable via TCP/IP, RS-232, IR, and front panel push buttons and LEDs. Alright, what’s the price tag on all these units? Clearly, the most cost-effective device with a complete set of receivers is Key Digital’s KD-Pro8x8D, retailing at $9000. Alternatively, the AVPro Edge AC-MX88-AUHD-HDBT pops at $9999, while Atlona’s 8×10 matrix MSRPs at $12000. Key Digital will replace or repair the faulty unit with a product of equivalent or greater specifications that fixes the functionality of the system. Their products are covered by a 3-year limited product warranty, as long as the unit is acquired from an authorized Key Digital reseller. AVProConnect secures its solutions with their 10-YEAR “NO BS” warranty. They will either troubleshoot with you over the phone, give the customer the benefit of the doubt when it comes to troubleshooting, and provide a replacement if the unit is defective. Atlona has the “Atlona Advantage,” which is a 10-years limited warranty with next-day advanced replacement in the first year. Atlona’s tech support is also available 24/7, including weekends and holidays. Their warranty is a significant plus for mission-critical installs, whether it’s troubleshooting over the phone, design services, or product training. Which of the three 4K HDR 8×8 matrix switchers performed best when switching? We installed each device to a PS4 Pro, Xbox One S, and a Blu-ray player that supports up to 1080p. Each 4K HDR 8×8 matrix switcher was connected to 4 displays. We tested their switching performance based on 1080p and 4K resolution. From our test, the Atlona unit performed the fastest switch. Key Digital showed consistency whether we were switching 1080p or a 4K signal. AVPro Edge placed third when it came to speed; however, their matrix is the only device with a built-in scaler. You can watch the performance test on our YouTube channel, BZBtv or click here. Each of these units is excellent 4K HDR 8×8 matrix switchers for residential or commercial applications. If you require a complete package, then we recommend the Key Digital’s KD-Pro8x8D. We love that it comes with a bunch of accessories, including eight receivers. Also, KD has a free app that you can download for iOS or Android for simple control functions on your phone or tablet. If your client does not want to upgrade his current equipment and you need an 8×8 matrix switcher that will support 4K HDR as well as 1080p switching out of the box, the best-suited unit that will allow you to mix n match old and new devices is the AVPro Edge matrix switcher. Lastly, if your application is mission critical for a commercial job, we recommend the Atlona matrix switch that can support all current HDR formats. Their award-winning support which includes 7 days a week, 365 days a year including holidays will give any integrator/installer the confidence to get the job done right the first time. In any case, each of these units is fully capable of performing these tasks; the choice is up to you. 8K Is on the Way! What the 4K? !